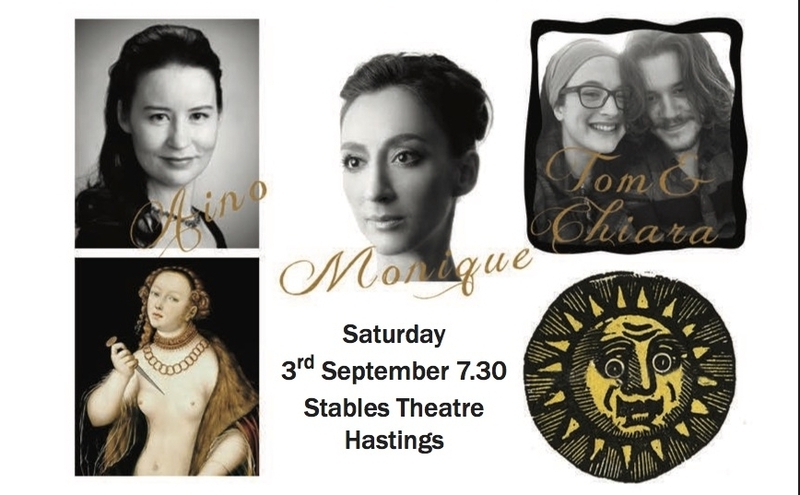 Saturday 3rd of September will see the Stables Theatre play host to an evening of ballads with Barefoot Opera. As part of this year's Hastings Fringe Festival programme, Barefoot Ballads offers three enticingly contrasting mini shows. Monique Klongtruadroke will reprise, with variations, 'Death of a Party Girl'. Monique amazed and delighted the Hastings crowd at this years Fusion Cabaret with her show about the Grand Opera party-girl at the end of her tether. Chiara Vinci and Tom Clarkson, who captivated audiences with their 'Barefoot Ballads' last February as part of the Fat Tuesday Unplugged line-up, have developed their set of folk songs reflecting the darker side of human nature. Their show encompasses dance and theatrical story telling, enriched by the fine harmonies between their voices, and the instrumentation. Aino Konkka will present an entirely new version of Handel's gripping mono-opera, 'Lucrezia', with pianist Helen Ridout, and along with her fellow Barefoot Balladeers will be packed into fifty minutes of musical and theatrical richesse.